If Deipno Spymaster is stunned and I chose a different house for my turn, can I use his “Omni:” ability to trigger and remove the stun effect? Yes. 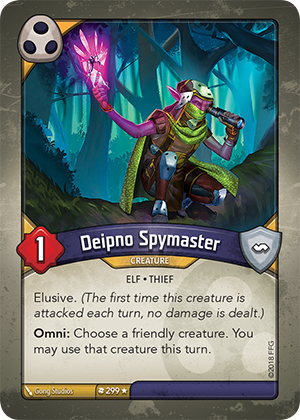 The Deipno Spymaster would follow normal stun rules: the ability fails, the creature becomes exhausted, the stun token is removed, and the creature will be readied during the Ready Phase (at the end of its owner’s turn).